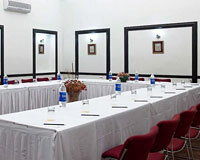 Royal Orchid Metropole is located close to the famous Mysore Palace. 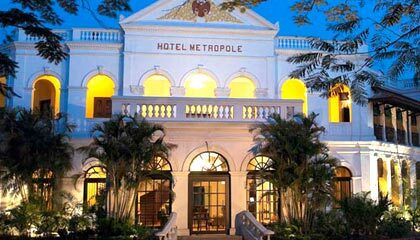 Royal Orchid Metropole is a 4-star luxury heritage hotel, built as a royal residence back in 1920’s for the British guests of the Maharaja of Mysore. The mansion now serves as a resort, which continues the building’s legacy of gracious hospitality. 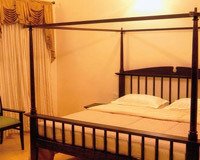 A paradise of luxury and charm, the hotel is decorated with period antiques and is one of the most sought after luxury hotels in Mysore. The beautiful architecture of this royal mansion and excellent services provided here, give a real feel of the royal luxury to its guests. 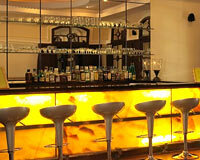 Thus, Royal Orchid Metropole is perhaps the best place to stay and get pampered in luxury in Mysore. 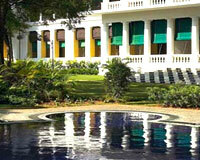 The hotel offers luxurious accommodation in its 30 Suites, categorized into Heritage, Maharaja and Royal. 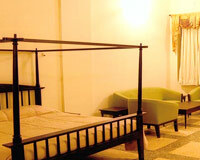 Each suite is furnished with handcrafted antiques, complete with a range of modern amenities and services. 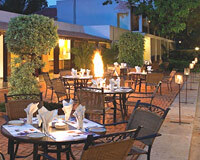 Shikari: An open-air restaurant serving exotic barbeque delicacies. Scandel: A vibrant bar offering a blend of liquor, mocktails and music. 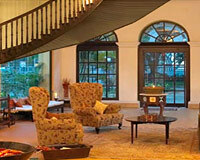 High Tea: A warm lounge providing freshly blend coffee, beverages & snacks. 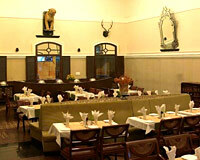 Tiger Trail: A place with exquisite décor offering great food and drinks.